If you’re like me, you hate to waste food. 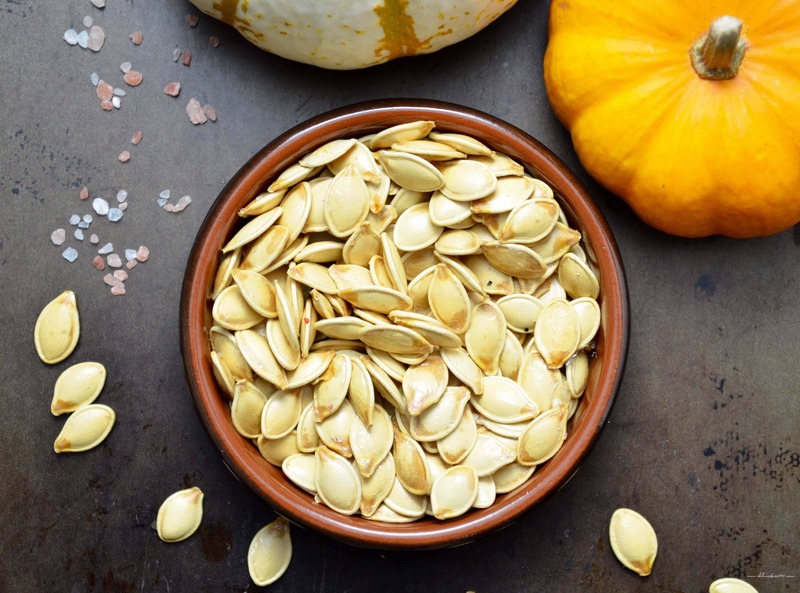 And yes, pumpkin (and also butternut squash) seeds are food! A snack food, to be specific, that I guarantee you will love! 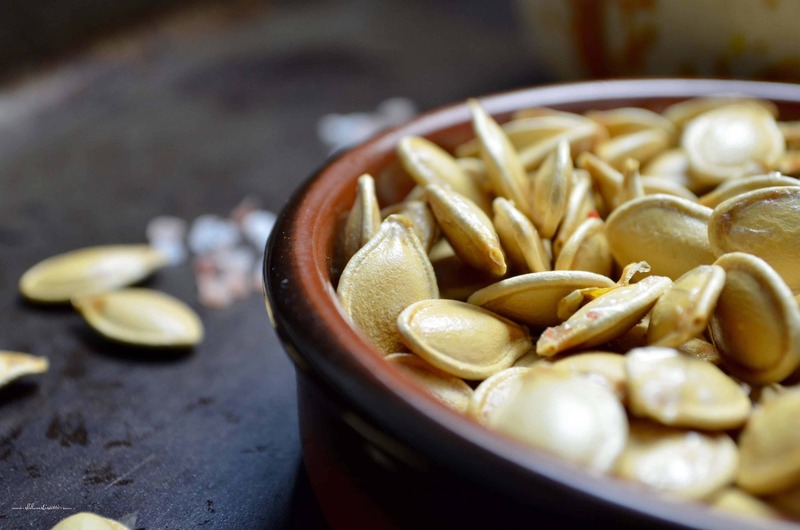 Are you ready to make Slow Roasted Pumpkin Seeds? Alright then, let’s start. 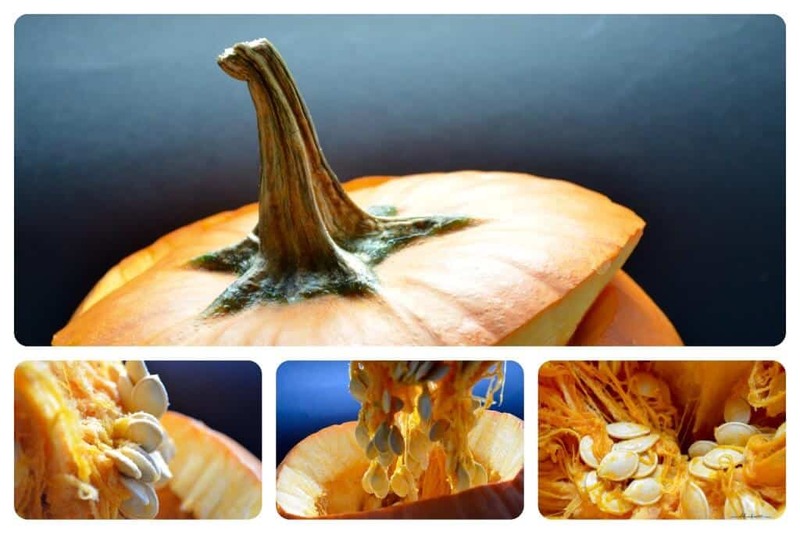 In order to get to the seeds, we have to open up the pumpkin – a lot easier said than done. With a steady hand and a really sharp knife, cut a hole large enough in the top of the pumpkin, big enough for your hands to fit in. This is a great activity for the kids. In my experience, they love discovering the “sliminess” and “wetness” of the seeds! The goal is to remove, to the best of your ability, the stringy fibers surrounding the seeds of the pumpkin. I like to keep a large bowl of water next to my pumpkin and just deposit fiber and seeds. If you do this, you’ll notice that the seeds will float to the top: the rinsing process has already begun. Once all the seeds have been removed and properly rinsed, give them some time to dry. They won’t roast properly if they’re wet, after all. You can either spread out the seeds on a paper-lined cookie sheet (or use a tea towel) and let them sit there for an overnight stay, or you can just pat them dry. The next step involves some olive oil and some kosher salt. (I had some pink Himalayan salt that a colleague of mine shared with me, so this is what I used). Toss the seeds, oil and salt in a bowl. The roasting begins now! Since the roasting temperature has to be super low, some patience is required for this step of the process. But not to worry – in just under an hour, your patience will be rewarded with a wonderful treat. 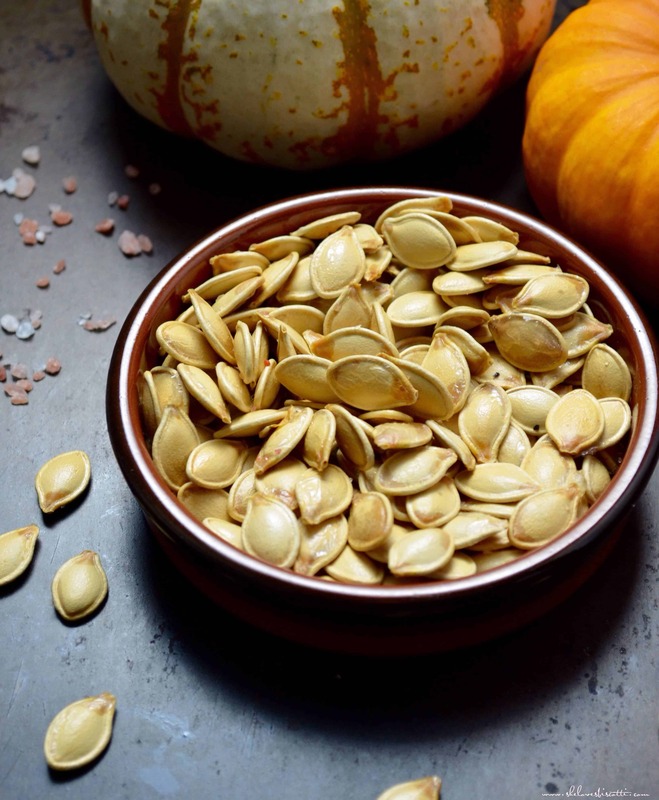 Nutrition Tip: Pumpkin seeds are not only edible; they are also extremely addictive. And that might be a good thing! There are so many health benefits associated with this power food that I will only focus on one. 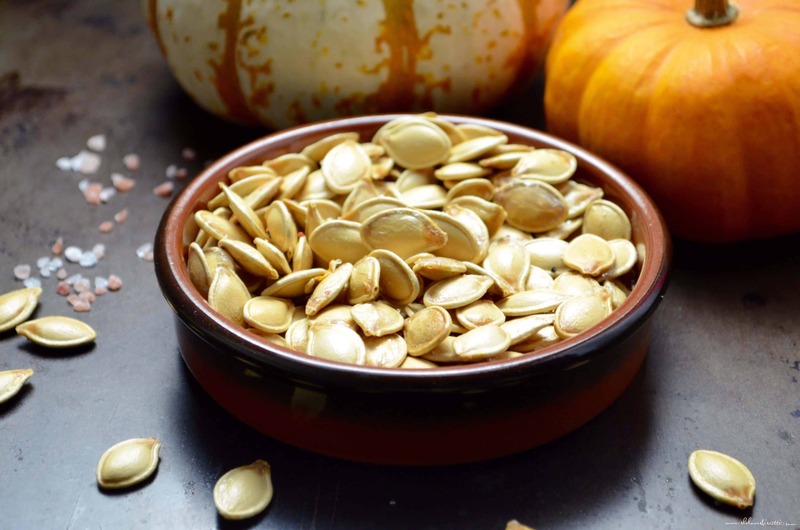 Did you know that pumpkin seeds are a good source of zinc? Zinc is important in keeping a healthy immune system and building protein. It’s also important in maintaining a good sense of smell. Remember, a reasonable serving for most nuts and seeds is about 1/4 cup. Back in the day, when I was a kid, my parents would always have a pumpkin for us to decorate for Halloween. My Mom would create an opening in the pumpkin and the three of us (my brother and sister and I) would try to collect as many seeds as possible. 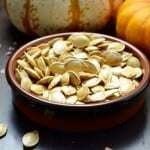 Once we had gathered all the seeds, my mom would make the Slow Roasted Pumpkin Seeds. No fancy seasonings at our house. It was a simple roast with olive oil and salt. Of course there would never be enough seeds for us and my mom, being the peacekeeper that she was, would divide them perfectly into thirds for my siblings and I. The seeds made such a strong impression on me that they are now the primary thing I associate with Halloween (along with candy, obviously, and the ever-classic, “It’s the Great Pumpkin Charlie Brown“). 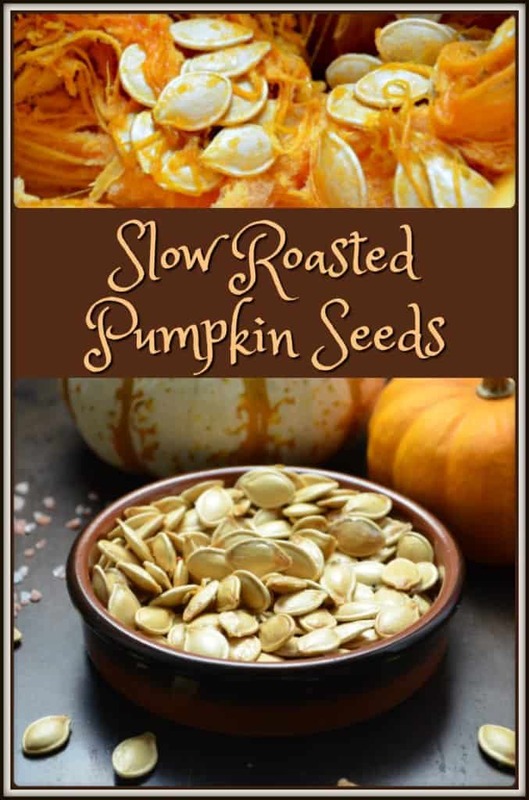 So if you are planning to make a jack-o’-lantern (or two) for Halloween, don’t forget make some Slow Roasted Pumpkin Seeds! Delicious, totally addictive, and good for your health. So if you are planning to make a jack-o'-lantern (or two) for Halloween, don't forget make some Slow Roasted Pumpkin Seeds! Delicious, totally addictive, and good for your health. Coat baking pan with non-stick cooking spray. In a medium bowl, toss the seeds, salt and olive oil together. Spread seeds evenly on baking sheet. Place in oven and roast for about 45 minutes. Stir the seeds every 10 minutes or so.